Research shows that exercise is one of the best treatments for osteoarthritis. Exercise can improve mood and outlook, decreases pain, increases flexibility, strengthen the heart and improve blood flow, maintain weight, and promote general physical fitness. You can use exercise to keep strong and limber, improve cardiovascular fitness, extend your joint’s range of motion, and reduce your weight. The following types of exercises are part of the well-rounded arthritis treatment plan. These exercises strengthen muscles that support joints affected by arthritis. They can be performed with weights or with exercise bands, inexpensive devices that add resistance. These are exercises, such as brisk walking or low-impact aerobics that get your heart pumping and can keep your lungs and circulatory system in shape. These exercises keep your joints limber. These help you maintain daily living skills. *Ask your doctor or physical therapist what exercises are best for you. Ask for guidelines on exercising. 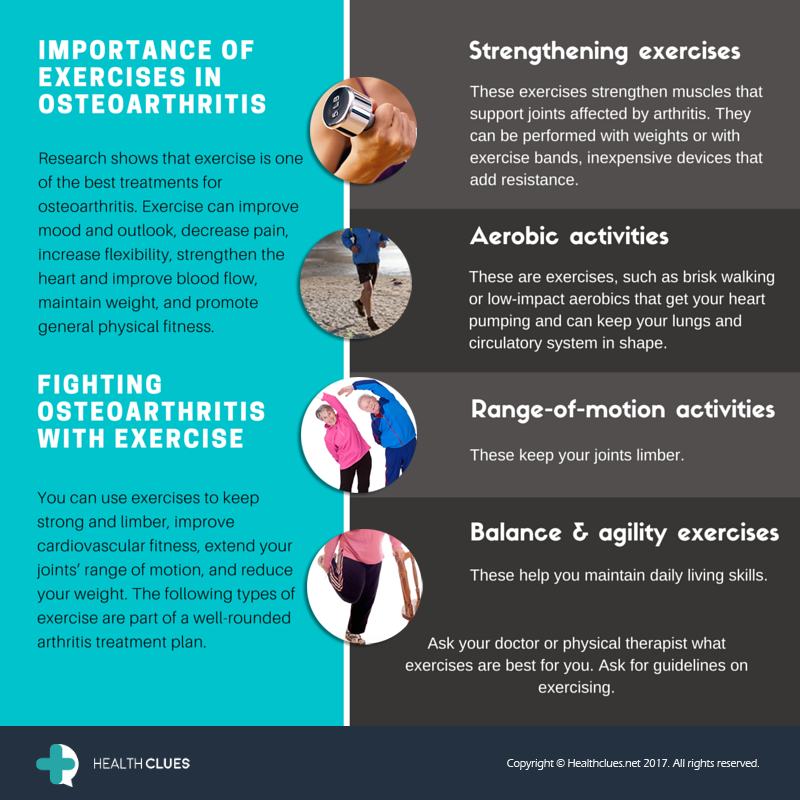 Infographics, Osteoarthritis Aerobic activities, arthritis, exercise for osteoarthritis, osteoarthritis, Strengthening exercises. permalink.